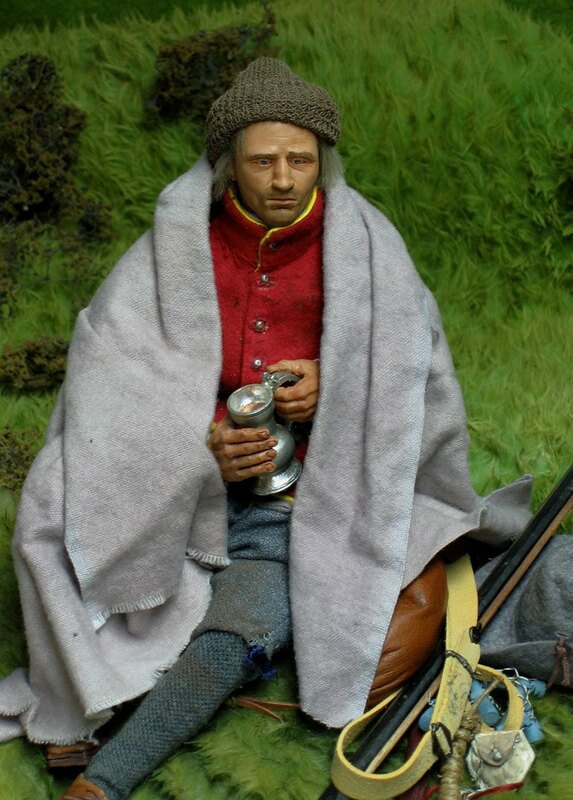 The New Model was formed in the winter of 1644/ 1645 from three existing forces : The Earl of Essex’s Army, Sir William Waller’s Army,and the Army of the Eastern Association. Once it was shaken down and properly trained, it’s campaign in 1645/6 was decisive : it won the war. It then went on to win the Second and Third Civil Wars, and became the decisive political force in Britain : that is another story. It had twelve Regiments of Foot, each of a nominal 1200 men, and from the outset efforts were made to clothe and equip it in a uniform manner, though it was probably about a year before they achieved this goal. 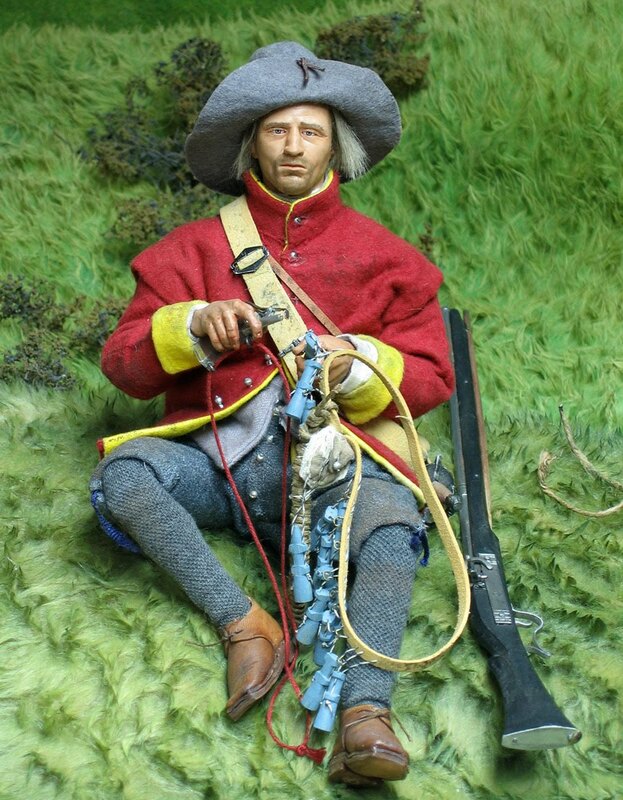 Its soldiers were not the first English troops to wear red, but this time all the Infantry were thus clad, with each regiment having its coat lined in one of a range of different colours, the beginning of the coloured facings so familiar from later centuries. Yellow may have been worn by Skippon's Regiment , largely recruited from the southeast and London . We are fortunate to have some surviving contracts describing the uniforms, and the figure is based closely on what we can surmise from these, and other documents. This is a completely scratchbuilt figure . 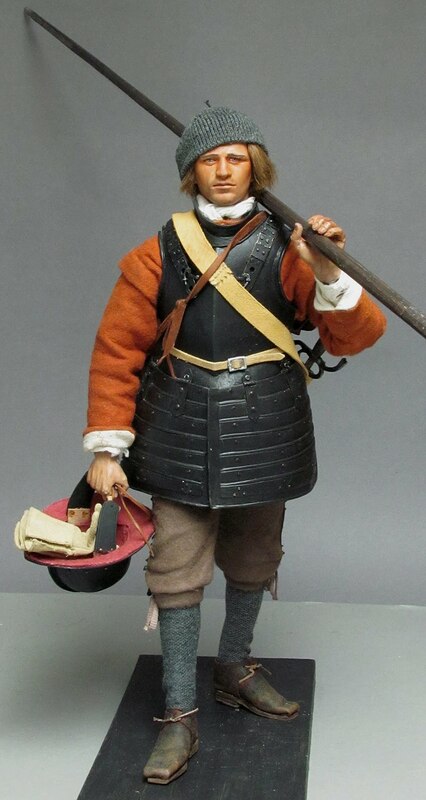 The Musketeer , though supported by Pikemen , became more and more important during this later phase of the war. Their ability to attack and defend equally became decisive : a harbinger of the future tactical shape of war. 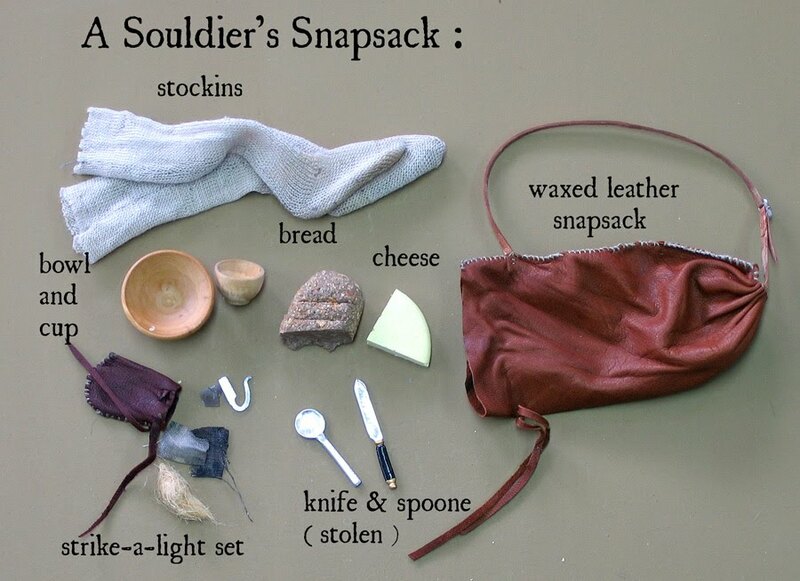 He carries a musket, an issue bandolier , a cheap sword , a length of match , and a snapsack. which many pressed soldiers were. By the time of the formation of the New Model, most of those recruited were properly trained, and modern experiments have shown that it's possible to load & fire a matchlock in less than a minute . Only a little slower than a flintlock , and a matchlock very rarely misfires. The type he carries has a shortened barrel , which means he doesn't need a musket rest. The sword is a cheap " Tower " sword , mostly used for threatening peasants and chopping wood. meant they often had to fend for themselves. The bandolier has twelve " Boxes " or wooden bottles, each containing a standard charge for the musket. Although paper cartridges were known , the price of paper made them expensive for massed troops, so the bandolier continued in use until the late 1600s. Most of the time on campaign they bedded down in commandeered buildings , but sometimes in the fields and hedgerows. There seems to have been no provision of bedding of any kind , which was presumably seized from the nearest village at need, along with food and drink. 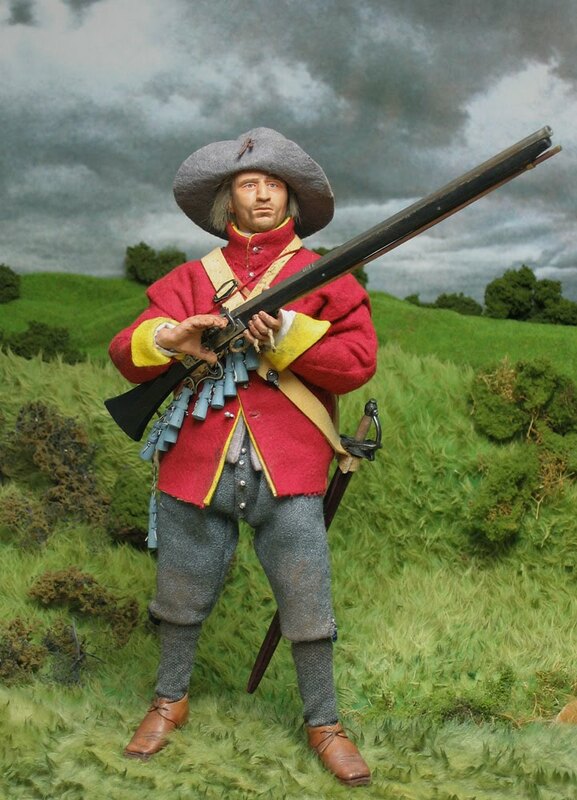 At the start of the war, the Parliamentary Foot are thought to have had access to a lot more weapons and equipment than their Royalist counterparts. Certainly , we know that they had access to most of the main arsenals, and the stocks kept at the Tower , which meant that they took the field in a nearly perfect state , with armour and swords for the Pikes. 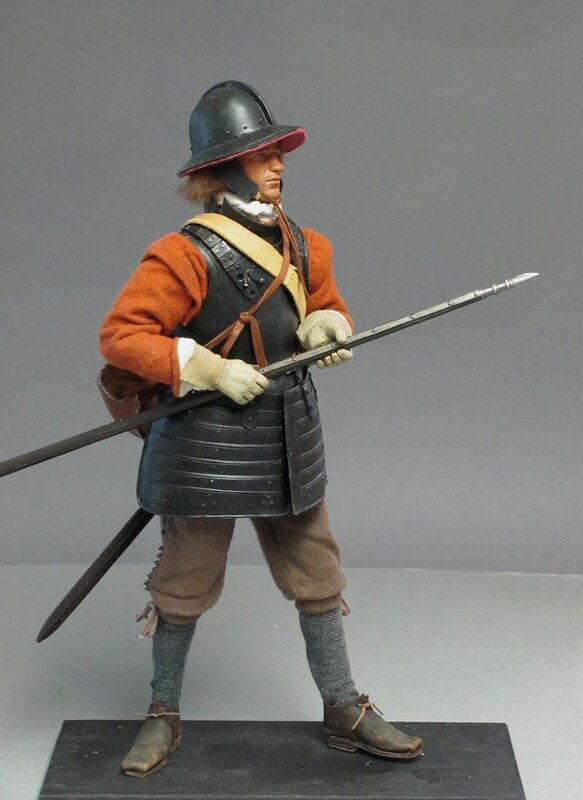 This figure represents one of the Pikemen of the premier Foot regiment, the Earl of Essex's Own , wearing a coat of the unusual orange-tawny that was his livery colour. The armour here is made from Sculpey ,with metal rivets and fixings, and is typical of the English made suits available at the time. It's likely that this armour gave them a distinct advantage during the first battle of the war , at Edgehill, which resolved itself into an infantry slogging match which the Parliament had the better of, despite losing the cavalry encounter. Later in the war it started to be discarded ; it was unbelievably uncomfortable to march in, would not stop a bullet ,and despite the best efforts of the officers, by the end of the 1st Civil War it was getting rare. The Scots Army never seems to have had any body armour at all , and when the New Model went to Ireland it left it all behind .The dominant weapon was now the musket . Otherwise, he carries a sword and a snapsack, and a knitted cap to wear when not wearing the helmet.